Professional portfolio of Dr Ishan Abeywardena where he talks about research in OER, eLearning, MOOC, ODL and mobile, VR and AR application development. Many students still walk long distances to school. Some of them miss school because they don’t have footwear to last the journey. Some classes don’t have enough desks and chairs let alone computers and mobile devices. Electricity is intermittent. Children need a printed book so that they can study using a lamp if there is no electricity. Internet and mobile bandwidth are still concepts gaining traction in cities. The penetration is marginal if non-existent in the rural areas. The major activities contributing to the cost of a textbook include printing, warehousing and distribution. So, the question remains, how can OER reduce the cost of textbooks for students in developing countries? I believe that the solution is multifaceted and involves governments, institutions, teachers, parents, learners and civil society organizations working together towards a better future for the peoples. Since I’m in a transition period in my career, I thought I’d give this some serious thought. 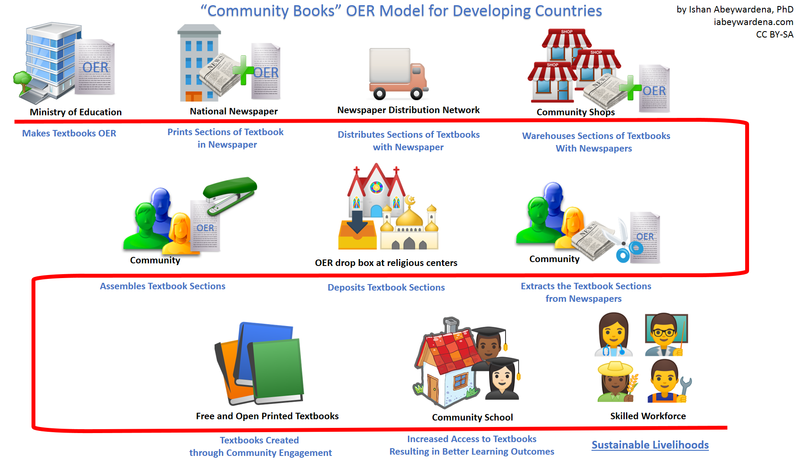 This led to the conceptualization of the “Community Books” OER model (click here to see in full). I’d love to hear your views on how to develop it further. I’d be delighted if anyone is interested in a pilot project. I’d like to do a pilot after discussing with a local government area. There are approves books for primary and secondary schools here in Nigeria. Better still in higher education. Thanks for the positive feedback. Please do let me know how I can help to pilot this. All views expressed on this site are my own and claim no affiliation to any institution, organization or individual.